My Twitter and Facebook feeds have been awash with comment and reaction to the survey titled ‘The fine scale genetic structure of the population of the British population’ published in the journal Nature last week. The authors examined the DNA profiles of populations in different areas of the UK with a view to identifying historical migrations to the UK from various European locations, and Cornish commentators have picked up on the fact that the results show that the genetic structure of the sampled population in Cornwall clearly differs to the rest of England. The study has been heralded as a victory by some, who regard the findings as conclusive proof that the Cornish are not English – with the Western Morning News’ article going so far as to say that this implies that we are ‘breeds apart’. However, the authors of the study also suggest that the genetic profile in Cornwall is actually much closer to groups in Devon and elsewhere in England than to groups in other mainland Celtic regions of the UK. 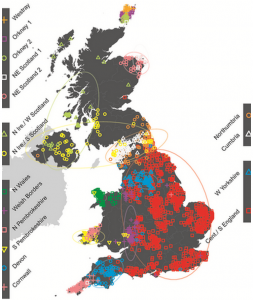 Further, the study indicates that ‘the Celts’ that historically populated the British Isles actually comprise of several distinct genetic groups originating from different parts of Europe, rather than one homogenous group. The publication has provoked a lot of (occasionally heated) discussion of Cornwall’s Celtic identity and as such the study, and reactions to it, is very interesting for me since I am currently examining how notions and constructions of Celtic Cornwall were used to promote patriotic sentiment towards Cornwall in the late 19th century. For me, this is an extremely tangled web of how concepts of race, language and culture interact with notions of identity. This study seems to confirm some elements of the idea that the Cornish identity could be built on the idea of a Cornish race. However, I think that we have moved away from the concept of race as a qualifier for Cornish identity, simply because the term is too blunt – and potentially damaging – an instrument to describe a contemporary and diverse group of people who have different perceptions of what Cornish identity is. In my own case, I was born and brought up in Cornwall, but not bred – both my parents are from England who moved to Cornwall independently, met, married and settled there. I describe myself as Cornish because I feel that the place has unquestionably shaped who I am regardless of my parentage; yet genetically, I’m not one of those pink crosses west of the Tamar river. In terms of linguistic identity, Cornwall’s own language (Cornish or Kernewek) is an important marker of identity. Once you get over the Tamar it’s obvious that place names in Cornwall are very different to those in England. For the growing minority of Cornish speakers, the debate continues to rage about whether, and if so, when, the Cornish language stopped being a spoken vernacular, and which version of the revived language speakers should use. Indeed there is a case that Cornish has never really died as it exists beyond the lifespans of its speakers (past and present) in the landscape. As a counterpoint though, there are plenty of people who would self-identify as Celtic (not just in Cornwall, but all over the UK, Europe and indeed the rest of the world) regardless of whether they speak a Celtic language or not. Who is in a position to deny self-ascribed Celts their claim to their perceived heritage on the basis of their linguistic ability? I’m learning Kernewek Kemmyn, but I don’t see why this would make me any more Cornish, or Celtic, than someone who is Cornish born and bred who doesn’t speak it. In fact in my research, I have come across the interesting alternative opinion that the revival of the Cornish language is a rather sectarian attempt at gaining credibility for a Cornish cultural agenda and simultaneously creates a false cultural elite. For some perhaps, to paraphrase Louis Armstrong, if you have to learn something to be Cornish, you’ll never know. So, if racial/genetic and linguistic concepts are not necessarily solid foundations on which to claim or build Cornish Celtic identity, what about Celtic culture? Socially, politically, economically, religiously – Cornwall’s culture has obviously changed and developed over the intervening two thousand years since the Celts were in control of the area we now know as Cornwall, reflecting and reacting to broader cultural changes across the UK. So since we’re talking about a contemporary study based on contemporary population samples, what about the average person on a Cornish street or moor or beach? What elements of their culture would they say make them Cornish – and would they say that these are examples of Celtic culture? Does playing Cornish music make you Celtic? How does that music qualify as Celtic? Is singing in a male voice choir Celtic? Is playing rugby Celtic? What about wearing the Cornish tartan, even though it was invented in the 1960s? Are pre-work dawn surfs Celtic? Or do we ‘elect’ these activities as Celtic in our perception? All these complicating factors make me question why being Celtic such a central and continual concern for Cornwall? Does Cornish identity automatically include or imply Celtic identity? These aren’t supposed to be silly or rhetorical questions; obviously, Cornwall’s Celtic heritage is a massively important part of Cornwall’s history and has informed (and been deployed within) academic and popular debate for hundreds of years. However, I don’t think that being ‘Celtic’ is the outside boundary of Cornish identity. Personally, I regard Cornwall’s Celtic identity as one of many integral components within a complex and evolving culture that extends a long way beyond Cornwall itself. I suppose this post essentially asks lots of questions about a topic that there are a lot of very solid opinions about, but very few solid answers because they rely on individual perception rather than an universally accepted cultural manifesto. However, by identifying trends in opinion and performance, we can go some way towards understanding what cultural attributes have been important in Cornwall at different times, and what this tells us about how people perceived, performed and valued their Cornish identity. Comments, questions and feedback all welcome! Posted on 23rd March 2015 Categories Celtic, CornwallTags Celtic, Cornwall, culture, genetics2 Comments on Celtic genes for Cornwall?